…A boat that becomes a loom, a shadowy, red-eyed Cyclops, a pub inside a cigar box, live music, shadow puppets, and much more. This three-tiered hero story follows the journeys of Ulysses, Leopold Bloom and Joyce himself. The performance demonstrates how James Joyce interprets an ancient story to fit his own experience in order to write his revolutionary novel, Ulysses. In 1998, The Rosenbach Museum and Library commissioned Sebastienne Mundheim to create an educational program for elementary students based on the museum’s collection. James Joyce’s manuscript of Ulysses is one of the museum’s most significant holdings. “A Potable Joyce” was developed as the performance component of a larger educational program that sought to introduce students to the value of the manuscript as a document or artifact of the artist/author’s process. The performance introduces the manuscript, the process of writing, a little Joyce and Homer, as well as some new vocabulary. It also opens up discussion about how writers use metaphor as a literary tool. Through discussion and exercise, the program explores how an author collects experiences and images, in order to make his own life experience richer, and in order to build tools for expression. The larger education program includes hands-on art making, discussion, and writing. This larger program was originally conceived and implemented in collaboration with the Fleisher Art Memorial and local schools. “A Potable Joyce” has had many runs including a national tour of Ireland, sponsored by the Ministry of Arts and Culture. Approx. 6 hour load-in, 4 hour load-out. A Potable Joyce was originally conceived as part of a larger education program that included in-depth hands-on workshops in visual, literary, performing, and media arts. While the performance is a wonderful experience on its own, follow-up workshops allow viewers to explore the themes and concepts introduced in the performance in much greater depth. Workshops are always developed in collaboration or through discussion with the hosting venue. These workshops can range in length from one session to twenty sessions. They can be tailored for teachers, students, performing arts groups, and topic specific groups. 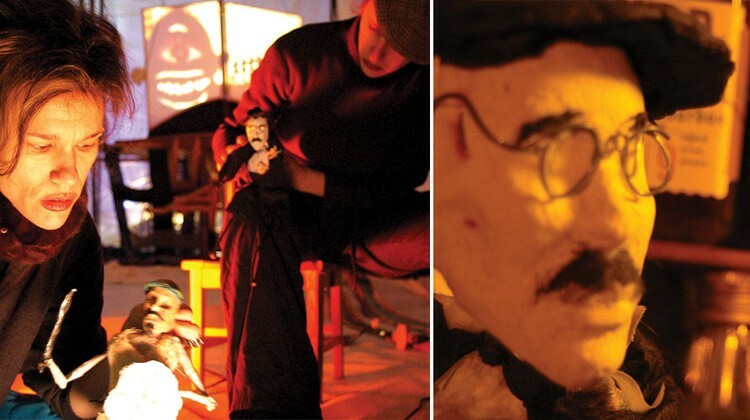 (We have created workshops that have ranged from puppetry to Modernism). Special Thanks for thoughtful input and/or creative labor and assistance: Bill Adair, Vicky Mahaffey, Sara Labov, Gene Diaz, Mike Barsanti, Elizabeth Fuller, Derrick Dreher, Thaddeus Phillips, Jennifer Snead, Matt Pappajohn, Lee Etzold, Tom Miles. Rebuild Story: In 2004 the entire set was destroyed by a storage company just before we left for Ireland. We had to remake hundreds of objects. An amazing group of over forty people contributed to the reconstruction of this set. Some worked tirelessly for weeks beautifully re-crafting (and improving) each object. These generous crafts people included: Kim Traube, Jen-Jen MacNeish, Stephen Shuster, John Fries, Amy Hirsch, Rodreigo Shopis, Martina Plag, Lauren Griffith, and many many others.